Have you been having issues with the auto-lock function on your device after downloading iOS 10? Well, you are not alone. In fact, a lot of customers have been complaining about how their devices will not auto-lock. If so, this article will help explain how to fix it. Auto-lock is a well-known feature on iOS devices. It is the reason why your phone will lock itself after being inactive. Some people forget to lock their phones or are too busy to do so, so the phone will automatically lock itself after a minute or so of inactivity. This helps keep your information safe, while still allowing you to see phone calls and texts that come in. You can change the settings for auto-lock, but the default settings are set to locking after one minute of being inactive. If that is too short for you and you would rather your phone lock after, say, five minutes, then you can change the settings. While this is obvious, I would like to go over the problem once again. The auto-lock feature is an incredibly useful one as it helps keep your information safe as well saves battery life. How does this save battery life? Well, if the device is locked then it is in a mode that uses less power and is not using power for brightness or apps running. When auto-lock is disabled, then, you are letting your battery drain a lot faster than needed. People are mad about this because they have auto-lock on, but are still having their phones continue to be on when it has been inactive; wasting their battery completely. This problem, of auto-lock not functioning, is occurring in some devices that have already downloaded iOS 10, so there is a bug in the update. It is not impossible to fix though, and I will explain the way to help fix it. If your auto-lock is set to never, then it will not be enabled. So, first ensure that your device’s auto-lock is turned on and set to the time that you want. Default is one minute if that is a good time for you. Go to your settings → display and brightness → auto-lock, and change the time for it. 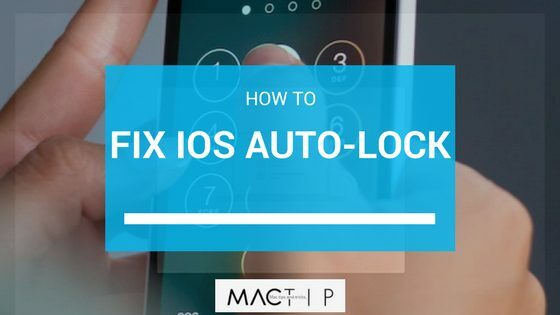 While I stated that the problem occurs in devices after they download and install iOS 10, some people have stated that even their iOS 9 devices’ auto-lock refuses to work. First, check your settings, as mentioned above, and ensure that your auto-lock is indeed turned on. If it is set to never or is not enabled, then it is not the settings that are the problem, and you should then follow the steps below in the next section. Now, to help fix the auto-lock issue on a device that has downloaded and installed iOS 10. First, turn off your device and restart it by holding the power button and the home button at the same time, until you see the apple logo appear on the screen. and check to see if that fixes the problem, if that does not work then move on to the next option. This time, before restarting your device, try checking the settings for auto-lock and then disable your passcode. After you turn it back on, re-enable your passcode and see if the auto-lock works. Try changing the auto-lock settings to different timers. Finally, if you have assistive touch enabled on your phone, disable it. This could mess with the auto-lock function, so test it after having disabled the assistive touch. I hope that at least one of these was able to help fix the problem. If not, then contact iTunes support, as it may be something to do with the internal hardware or the device itself. Remember that you can change the settings for auto-lock at any time, so try playing with them and see what you like best.